A contentious theory is put to the test with an almost-life-size replica. 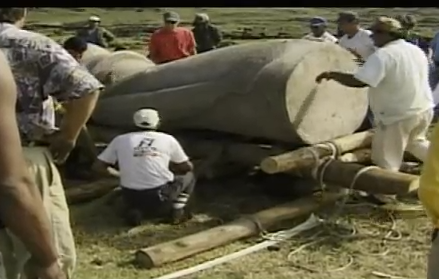 Easter Island’s gargantuan stone statues walked. That is the controversial claim from archaeologists who have demonstrated the feat with a 4.4-tonne model of one of the baffling busts. They describe their work in the Journal of Archaeological Science1. Nearly 1,000 statues litter Easter Island's 163 square kilometres, with the largest weighing 74 tonnes and standing 10 metres tall. Much about the megaliths is mystery, but few of the enigmas are more perplexing than how the statues were shuttled kilometres from the rock quarries where they were carved. Archaeologists have proposed that the Polynesians who settled Easter Island 800 years ago or more laid the statues (called moai) prone and rolled them along on logs. That idea supports the theory that the settlers, known as Rapa Nui, became so obsessed with statue-building that they denuded the island of its forests2. In his book Collapse (Viking, 2005), Jared Diamond, a geographer at the University of California, Los Angeles, touted Easter Island as the poster child for a civilization that blew through its natural resources and folded. “It’s a great story but the archaeological evidence doesn’t really support it,” says Carl Lipo, an archaeologist at California State University, Long Beach, whose team instead proposes that the Rapa Nui 'walked' the moai by rocking them from side to side, as one might move a refrigerator. Some statues are found on stone pedestals; others are in incomplete forms along roads or in a quarry. The incomplete statues — which Lipo says would have been modified once they reached their pedestals — lean noticeably forward, in a posture that doesn't lend itself to horizontal transport, says Lipo. Broken moai along roads, which were presumably abandoned, also point to vertical transport. On roads that slope upwards away from the quarry, the statues lie on their backs, whereas downwards-sloping roads tend to be littered with face-planted moai, Lipo notes. Lipo and Terry Hunt, an archaeologist at the University of Hawaii in Honolulu, noted these points in their contentious book The Statues That Walked (Free Press, 2011; see 'Anthropology: Head to head'). A US television programme later asked the pair to test their hypothesis with a life-size model. With the help of a ship-building company, they constructed a 3-metre-tall concrete model of one of the statues. The statue could not stand on its own and had to be rested on supports. But after several trying days, a team of 18 people chanting “heave-ho” managed to get the thing walking with three hemp ropes — one tied to it from behind to keep the statue from falling on its face and two on either side (see VIDEO - http://www.youtube.com/watch?v=yvvES47OdmY ). “It really hauls,” says Lipo: the team got the statue to travel 100 metres in under an hour. Lipo suggests that a small number of people working part time could efficiently transport moai, questioning a scenario in which Easter Island's population ballooned and later crashed, as Diamond and others have proposed. But not everyone is convinced by Lipo and Hunt's work. “What they did was a stunt and not an experiment,” says Jo Anne Van Tilburg, director of the Easter Island Statue Project at the University of California, Los Angeles. Yet aspects of the statues’ design seem intended for walking, contends Lipo. Their centre of mass is centred vertically and horizontally, but sits slightly forward of centre on the front-to-back axis, making it easy to rock the statues back and forth. Furthermore, the statues' relatively broad bodies and elongated heads make them stable when walking. “What’s cool is that their shape really reflects the engineering of the Rapa Nui people. They built these things to do this,” says Lipo. Lipo, C. P., Hunt, T. L. & Haoa, S. R. J. Archaeol. Sci.http://dx.doi.org/10.1016/j.jas.2012.09.029 (2012). Mieth, A. & Bork, H.-R. J. Archaeol. Sci. 37, 417–426 (2010).